I'm almost positive I know WHO played, but I want to know WHAT horn he played. I'm about 99% sure this is Tommy Johnson, and I'm trying to figure out how he's cutting so well! He sounded absolutely mind blowing! This is my favorite album with full orchestra. I really wish he was still living. Would love to met him, had a lesson with him, and picked his brain. The album I'm referring to is the Zubin Mehta recording entitled: The Great American Orchestras: Los Angeles philharmonic. If this WASN'T Johnson please correct me! The album to which you refer was released in November 2012 and includes pieces recorded years earlier by Mehta and the LA Phil. I don't have the answer to your question, but I'd guess most of the tuba stuff in that era was the work of Roger Bobo. 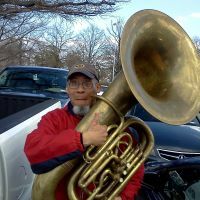 Tommy Johnson, who often played a Mirafone 188 CC tuba, did sometimes play with the orchestra-----he and Bobo played "Planets" together and can be heard on a recording. Maybe Norm Pearson can recall who played if you will identify which piece is the subject of your interest. Ace wrote: The album to which you refer was released in November 2012 and includes pieces recorded years earlier by Mehta and the LA Phil. I don't have the answer to your question, but I'd guess most of the tuba stuff in that era was the work of Roger Bobo. Tommy Johnson, who often played a Mirafone 188 CC tuba, did sometimes play with the orchestra-----he and Bobo played "Planets" together and can be heard on a recording. Maybe Norm Pearson can recall who played if you will identify which piece is the subject of your interest. On my phone it said it was released in 2006. Roger Bobo on his Mirafone 184 or 186. Tommy Johnson doubled some of the parts on the planets on his early 1960's Mirafone 185. Both of these gentlemen had extraordinary power and control and "core". No problems balancing the orchestra with any size tuba! I miss Mr. Johnson (and his playing) and I miss hearing Roger Bobo live. No one has ever fully appreciated Rogers sound unless it was heard live. I was lucky enough to hear it at the receiving end of the bell hundreds of times in the 1980s. Norm Pearson wrote: I miss Mr. Johnson (and his playing) and I miss hearing Roger Bobo live. No one has ever fully appreciated Rogers sound unless it was heard live. Could not possibly agree more on all points. Solo Bobo live - simply amazing. What beautiful and musical sounds. Roger Bobo's tone quality, dynamic range, and body of sound were extraordinary. I first heard him when we played in the All-California High School Symphony Orchestra in 1954----I was 18 and played 2nd trumpet. Roger,16, was in the row behind and I could hear him warming up on some difficult excerpts from Mozart's Bassoon Concerto. A couple of years later, we played in the Vine Street (Hollywood) Musical Workshop Orchestra which was dedicated to performing new compositions by southern California composers. I was honored to be in the same building with such a fine tuba player. In those early days, I think one of his main teachers was Robert Marstellar, principal trombone of the Los Angeles Philharmonic. I think Tommy Johnson was also one of Marstellar's students. Maybe Jim Self, also (?) I hope I got the facts straight in this post, but at age 80 one can make errors in memory. Norm Pearson wrote: Roger Bobo on his Mirafone 184 or 186. This isn't the first time you've replied to me. Thank you! What an amazing sound on that record.. Especially 1812. I mean the brass fanfare section is arguably my favorite section in any orchestral piece ever written, and listening to I guess BoBo just whale on it sounds mind blowing. It amazes me that they're doing it on such small horns. I guess the who thing about small horns cutting better could in fact be true. Thanks for replying again, Mr. Pearson. Love your work! Roger Bobo on tuba and Jeff Reynolds on bass trombone are hard to beat in terms of decibels produced on those instruments. Tommy and Roger doubled up on the "Ein Heldenleben" and "Alpen Sinfonie" recordings. Both are excellent R. Strauss recordings. I don't think "Sinfonia Domestica" has two tuba parts, but someone can correct me if I'm wrong. It helped that most of those old Decca recordings were made in Royce Hall on the UCLA campus. TubaZac2012 wrote: Zubin Mehta recording entitled: The Great American Orchestras: Los Angeles philharmonic. Many (many) recordings released within the past 10 years via online services are just repackagings of old recordings. Here is how you do your research. Google the ensemble, conductor, and composition in that order. You'll get a list of sites giving data about the ORIGINAL recording in question, and there are a few sites with lots of information like actual recording session dates/locations/etc. Once you know WHEN the piece you really like was recorded, then you can consult the orchestra history to have a very educated guess as to the tubist. Given you're liking a recording with Mehta and LAPO, and as Mehta didn't do many (if any) recordings with the orchestra after he left as music director (1978), you're most likely (95%) enjoying Bobo on those tracks. That said, the LAPO/Mehta recording of the Rite of Spring is even MORE tuba heavy than the legendary Planets recording. Bobo and Johnson are jaw dropping. tuben wrote: That said, the LAPO/Mehta recording of the Rite of Spring is even MORE tuba heavy than the legendary Planets recording. Bobo and Johnson are jaw dropping. When Rob talks classic recordings we haven't heard I immediately seek them out!